Both the marketing and the sales team can benefit from Delacon’s call tracking integration with Salesforce. Following the same principle as the “web to lead” functionality for online leads, when a prospect calls your organization a new lead will automatically be created in Salesforce and populated with the call data captured by Delacon’s system. We call this the “call to lead” functionality. If the caller’s phone number is already attached to a contact or an account, the integration will automatically create a new activity populated with the call data rather than creating a new lead. Delacon has two Salesforce integration options – Real-Time Live Integration and a Post-Call Non-Live Integration. In the non-live integration the newly created lead will be available between five and twenty minutes after the call ends. All available call fields will be populated with this option including the call duration, feedback outcome, call recording file link, keywords used and the referral URL. To access the Salesforce record, the operator needs to enter the phone number of the caller into the search field of Salesforce after gathering that information from the caller. If the operator doesn’t have the phone number, they can search for the latest lead entry. With Delacon’s live integration, the data is available in real time – so that the sales team can use this information to influence their conversation with the lead. In essence Delacon’s solution provides invaluable data to the sales team of what the lead has done prior to the call. The fields that will be populated include the call start time, device used, keywords used, number dialled, referral URL, search engine used and the landing page. 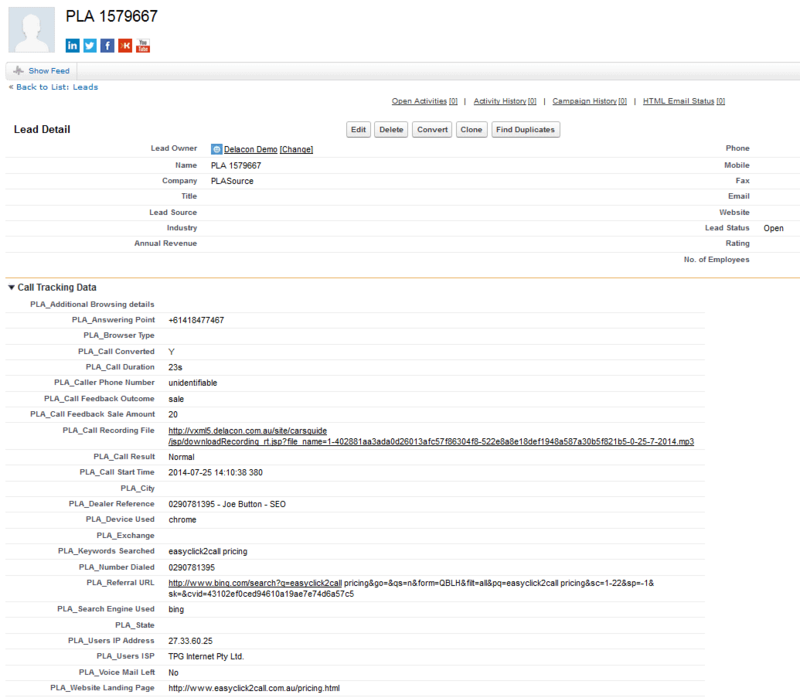 To access the live Salesforce lead record of the caller while they are on the phone, there are two identifiers – the telephone number or a unique key or code associated with the phone call that’s generated by Delacon’s system. If you’re using a VoIP phone connection, we can display the caller’s phone number or the code on the operator’s telephone screen. If you’re using a PSTN system we can only display the caller’s phone number. We can also set up a whisper message prior to the call connection that will tell the operator the caller’s phone number or the code. The operator can enter either identifier into the search field of Salesforce to access the newly created lead. By mapping the call tracking data to the Account fields, you’ll be able to keep an accurate history of the entire customer’s journey. This is gold for marketers because you can now accurately link the initial marketing initiative with the customer – even if it takes months or years to convert them from a prospect to customer.